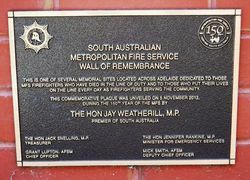 The refurbished Wall of Remembrance was unveiled on the 5th November 2012 and honours those firefighters who have lost their lives in the line of duty in South Australia. The Wall of Remembrance was refurbished as part of the 150th anniversary of the Metropolitan Fire Service in South Australia. The Metropolitan Fire Service (MFS) has been fortunate to have not lost any firefighters in the line of duty since 1977. A total of seven firefighters have died on duty since 1886. Thirteen Country Fire Service (CFS) volunteer firefighters have been killed in the line of duty since 1979. This is one of several memorial sites located across Adelaide dedicated to those MFS firefighters who have died in the line of duty and to those who put their lives on the line every day as firefighters serving the community. The Hon Jay Weatherill, M.P.